Early certified rare coins offer balance to your core bullion holdings. Here are a few suggestions, please confirm availability and price. Pictures available upon request. Call (800) 225-7531 for more information. And your satisfaction is always guaranteed. US Colonial Coinage – Easily one of the most historical areas of numismatics – interesting, packed with hidden treasures and wild stories of early American life. US Type Coinage – As the name implies each is a different “type” or denomination. Lots of choices promoting creativity and value building regardless of budget. Proof Buffalo 5 Cent Piece– The Buffalo series was struck from 1913 through 1938. Yet there are only 7 proof years and all of these are difficult to find in higher grades. Half Dime – The first half dimes were struck in 1794 and the series continued through 1873. Early examples are moderately priced, later examples are still quite reasonable. Proof Liberty Seated Dimes – Seated dimes were struck between 1837 and 1891. The first proofs were seen in 1853 and for the most part were struck each year through 1891. Most are surprisingly inexpensive in higher grades. Great value and potential. Barber Quarters – Struck between 1892 and 1916 – considered a “workhorse” coin of its time. Both proof and mint state examples are worth your attention. Standing Liberty Quarters – Replaced the Barber Quarter – struck from 1916 through 1930. Outstanding design & popular. FH (Full Head) examples are highly sought after. 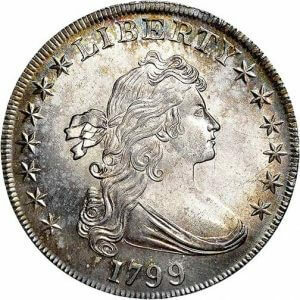 Draped Bust Half Dollars – One of the most popular early American coins struck between 1796 and 1807 – rare in all grades, exceedingly rare in high grades. Barber Half Dollars – Also called the Liberty Head Half Dollar – struck between 1892 and 1915. High grade examples in proof and mint state are always desirable. Inside tip – buy only top of the line examples with terrific eye appear and “pop”. Liberty Walking Half Dollar – A land mark coin, struck in both proof and mint state (1916 and 1947). A great value area which is desirable & inexpensive in high grades. We are currently sold-out of the popular Short-Set (20 MS-65 coins 1941-1947). Proof Walking Lib Half Dollars – This series was stuck over 25 years yet there are only 7 proof years available and 6 of these are still inexpensive even in high grade. Heraldic Eagle Reverse – The most affordable in the series, these historical coins have a wide following in all grades. Picture America’s first mint in Philadelphia and workers drinking beer – it was actually encouraged, the water spread yellow fever. Proof Trade Dollar – Struck from 1873 through 1885 – The Philadelphia Mint produced 13 proofs – two being major rarities the remaining 11 proof coins are undervalued. Better Morgan Silver Dollars– A traditional and trusted investment area with a huge following. Struck between 1878 and 1904, bought back in 1921 for a short time. Better Peace Dollars – Issued between 1921 and 1935 the Peace dollar was a commemorative peace coin designed by an Italian immigrant using his beautiful wife as the model for Liberty. With diligence one can assemble a magnificent 24 coin set in MS-65! The stoppers being the 25-S, the 28-S and 34-S – the remaining 21 coins are undervalued, surprisingly affordable and historically important. The inside tip here is not to “buy the holder” – look for fully brilliant, blast white examples with terrific eye appeal. Select US Investment Gold – Always popular – a selection of better material in high grades, including 2 1907 $20 High Reliefs and 2 popular Wells Fargo gold coins. Early Type 1 & Type 2 $20 Gold Choices– Struck between 1849 and 1876, sought after in all grades as these coins were struck during the gold rush days through the civil war. There is just something magical about these big early gold coins, they never last long. Classic Silver Commemoratives – Struck between 1892 and 1954 these historic coins commemorate important events in US history. They provide a world of education and a compelling investment dynamic. There are beautiful MS-65 examples which still trade for a song and all you need for big insight is Yeoman’s A Guide Book of United States Coins. Ask Sal for a free copy with your first purchase, he really likes commemoratives! Classic Gold Commemoratives – Struck between 1903 and 1926 most these coins are one dollar gold pieces. The exceptions being the $2 1/2 Sesquicentennial, the $2 1/2 Pan-Pacific Exposition, the $50 Pan-Pacific “Round” and $50 Pan-Pacific “Octagonal”. A “set” usually refers to 11 coins – two $2 1/2 gold pieces and ten $1.00 gold pieces. This series is woefully undervalued. If you are a contrarian investor it is one of the best opportunities out there to scoop up a few pieces before the secret gets out. Insider tip – when the US Mint struck these historical gold coins those that were not sold were melted. US Pattern Coins – Uniquely interesting – hugely popular – patterns are US Mint “idea” coins which were never placed into regular production. All are rare and a few have a wonderful dark side – “made to order” at night for important collectors or dealers. A mint official “perk” at the time to make a little extra money, today it would land you in prison. United States Error Coins– A wonderful area of rare coin collecting – mistakes which somehow were released into circulation to the delight of everyone except the US Mint. What does a model portfolio consisting of certified rare coins graded by either PCGS or NGC look like? There are many variations and the above selection represents what we hope will be an interesting beginning. If you are looking for something specific either call us toll free (1-800-225-7531) and ask for a check of our complete inventory or email richard@golddealer.com. I will add your interest area to my Want List – there is never any obligation and I’m happy to help or answer questions. First, certified coins offer an alternative to storing wealth which also protects against 3rd party intrusion. Second, certified rare coins offer financial privacy, investment potential and can be historically fascinating. Third, we believe many certified rare coins are undervalued. The bullion portion of your portfolio is simply a choice of bullion coins or bars. But what about the choice of certified rare coins when it comes to investment balance? We offer a few rules to get you started. WHICH ARE THE BEST EARLY RARE COINS? Which certified rare coins should you consider for long-term investment? In fact no person knows for sure, but there are parameters, which will lead you in the right direction. Look for coins which interest you – the more interest the more enjoyment – an added benefit. Early type, colonial coins, patterns, or better date silver dollars are a good start and these build good habits which lead to treasure and satisfaction. Rarity by itself is not the best way to approach this unique area. Rarity is good, but if there is no demand for a coin its rarity will be of little value. Link rarity with demand. Many certified coins are rare, but their popularity is what pushes their price dynamic. WHICH GRADE IS BEST? AND WHAT ABOUT EYE APPEAL? It is important that your certified coins are graded by PCGS (The Professional Coin Grading Service) or NGC (Numismatic Guaranty Corporation). This enhances liquidity and evaluation. Rare coins are graded using the Sheldon Scale from 1 to 70. The higher the number the better the condition and the more elusive the coin. As rarity and popularity increase so does price so look of a balance between rarity and affordability. At the same time “eye appeal” or what makes the coin “attractive” is very important. That is why rare coins of the same grade and type can vary somewhat in price. Certified rare coins with an interesting story are better choices. Stories and the history behind them are important because they bring these treasures to life. The more compelling the story the better the opportunity to build your valuable holdings. The price history of certified coins will tell you where in the cycle you are and provide clues which lead to good decisions. People who have a strategy are better equipped because they develop a long-term plan taking advantage of “up” and “down” markets. They do their homework and choose attractive early rare coins. Past performance does not guarantee future results but it’s a good place to begin. Like stocks some rare coins today can be purchased for less than their old highs which might indicate that a value buy is appropriate. On the other hand there are coins which are trading on their highs, not that we would dismiss these possibilities, but we want to identify both sides of the spectrum so you can balance your holdings. Follow the “50 year rule” – because it keeps you focused. Never invest in a rare coin which is not at least fifty years old because without an established record the outcome becomes unpredictable. Choose “coins of significance” and stay away from modern issues and certified bullion coins – there are better choices. Building a powerful collection creates a journey through history and is fun to boot – but requires patience. If you have a bunch of “old stuff” consider consolidating into “better” material with a theme. And read a few rare coin books along the way. There is an old adage in this trade which says “buy the book before the coin” – the more you know the better your results will become.